You are a psychotic slasher-villain and your goal is to escape whatever is trying to stop you and hide in the woods. 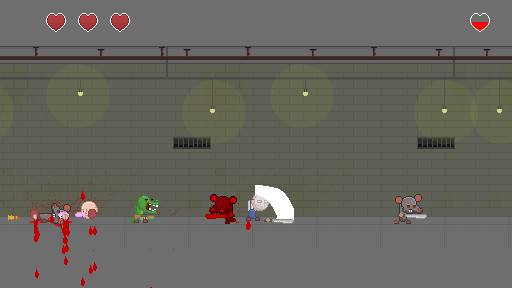 On your killing spree you encounter rats, cops, crocodiles and other enemies. Use the weapons you find along the way to brutally and violently stop these obstacles. If you manage to fill a heart container with blood you gain an extra heart. *The enemies/obstacles are procedural generated so every time you try it it's a different challenge. 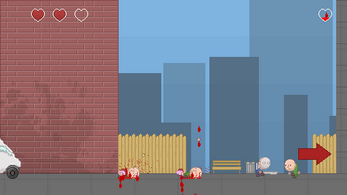 *Permadeath: None of your progress is saved when you die. Originally made for the Procedural Death Jam.